Travel to any major city and it's likely you'll find a modern art museum, a natural history museum, or maybe even a children's museum of sorts. Although these museums are visually educating and incredibly useful, boutique-style museums are popping up around the globe, sharing a more intimate, and sometimes local story. On the outskirts of a small German town called Schoningen, Holzer Kobler Architekturen have built the new Paläon Research and Experience Center, which focuses on the town's oldest hunting weapon - Schöninger spears. The location of the museum is built on a significant archaeological site, a plot of farm land where archeologists' excavated a series of 300,000 year old Schöninger spears roughly 20 years ago, the oldest complete hunting weapons ever. The discovery of multiple, completely preserved wooden artifacts from the Paleolithic Period were surrounded by an old hunting campsite where more than 10,000 bones of wild horses, seven wooden spears, spear fragments, and a boomerang were found. 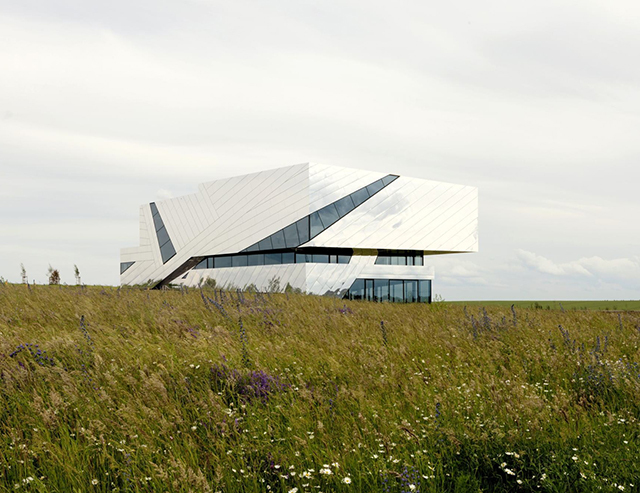 Founding architects Barbara Holzer and Tristan Kobler designed the outer skin of the new structure to act as a giant mirror that reflects the surrounding landscape and thus becomes one with the surroundings. Ultimately, the precisely crafted volume is covered with a reflective surface that becomes a mirror of the landscape. Tinted windows are carved out of the building in sharp cuts that sprawl across the mirror surface, which allows natural light to filter into the exhibition in an interesting way. Inside, white angular walls become a fascinating architectural backdrop for the rich history of Schoningen. The futuristic form of the building takes shape as the mirros are diagonally planked across the buildings surface.